This autumn is expected to be a season of milestones at Port Miami. Miami-Dade County’s seaport will be celebrating the arrival of new “super post-Panamax” cargo cranes, scheduled for next week, and the reactivation of a freight train line into the seaport later this month or next month. The developments come as Port Miami is hosting the TOC Container Supply Chain Americas 2013 exhibition and conference this week. The event is an annual meeting of seaport officials, terminal operators and shipping lines from around the globe. Last year’s conference was in Panama. This year’s three-day event, which ends today (10/3), is based at the Miami Airport Convention Center. This week’s conference was expected to draw hundreds of executives and representatives of port and terminal operators and logistics and shipping lines. A main topic of discussion was expected to be the impact of the expanded Panama Canal, scheduled for completion in 2015. Meanwhile, four super-size gantry cranes that departed by ship from China several weeks ago are expected to arrive at Port Miami between Oct. 6 and 8, according to port officials. The larger cranes – as well as the freight rail into the port – are needed to accommodate the larger cargo container vessels that will be able to pass through the expanded Panama Canal. Port Miami currently has two super post-Panamax size cranes, plus other smaller cranes. The new cranes cost about $43 million, paid from Port Miami’s capital improvement fund. The seaport operates on revenues from users – cruise lines, cargo companies and other businesses – rather than relying on tax dollars. Meanwhile, Port Miami was to preview its new Florida East Coast on-port, on-dock rail service during this week’s conference. The first rail car since the demise of the service after Hurricane Wilma in 2005 was to travel from the Hialeah rail yard Tuesday and cross the restored rail bridge into the seaport. It was to be a demonstration for industry officials and members of the news media. Port officials said a small group of international cargo trade and business media representatives had been invited on the first rail ride into the port, beginning with a tour of the new South Florida Logistics Warehouse near Miami International Airport. Officials called the warehouse “the linchpin of the intermodal operation” that is expected to pay dividends for Miami in the post-Panamax era of sea cargo shipping. During Tuesday’s rail event, officials added, Port Miami and Florida East Coast officials were expected to discuss the new seaport rail link, which they have said will enable cargo arriving at Port Miami to reach 70% of the US population within four days or less. Meanwhile, this week’s conference was to feature a series of expert panel discussions, including some with Port Miami officials such as Director Bill Johnson, Manager of Intergovernmental Affairs and Cargo Development Eric Olafson, and Assistant Director – Business Initiatives Kevin Lynskey. At last year’s Container Supply Chain conference, executives from container carriers indicated they had been gearing up to deploy larger vessels on all-water Asian-US East Coast services following the opening of the expanded Panama Canal. Mr. Olafson noted at last year’s conference that Miami also was gearing up as a cargo gateway for the Americas, with the goal of handling up to 3.38 million ton equivalent units, or TEUs, of container cargo by 2034. While the Panama Canal will be capable of handling cargo vessels carrying up to 13,200 TEUs, industry leaders at last year’s conference did not expect to see ships of that size immediately. “There will be no big bang, but a cascading of larger tonnage over time,” said Wolfgang Freese, Americas president for Hapag Lloyd, which moves about 10% of its global cargo volume through the Panama Canal. He and other executives agreed that ships capable of carrying 8,000 to 10,000 TEUs will probably emerge as the post-Panama Canal expansion workhorses of the shipping industry. The “cascade” effect of larger vessels and its regional impact – for cargo owners, carriers and port operators – has been a key talking point of the industry. “Overcapacity will be cascaded from East-West trades into more profitable trades, such as Latin America,” Alan Murphy, chief operating officer at SeaIntel Maritime Analysis, said last year. “Oversupply will put rates under pressure, with resulting increased rate volatility,” he added. 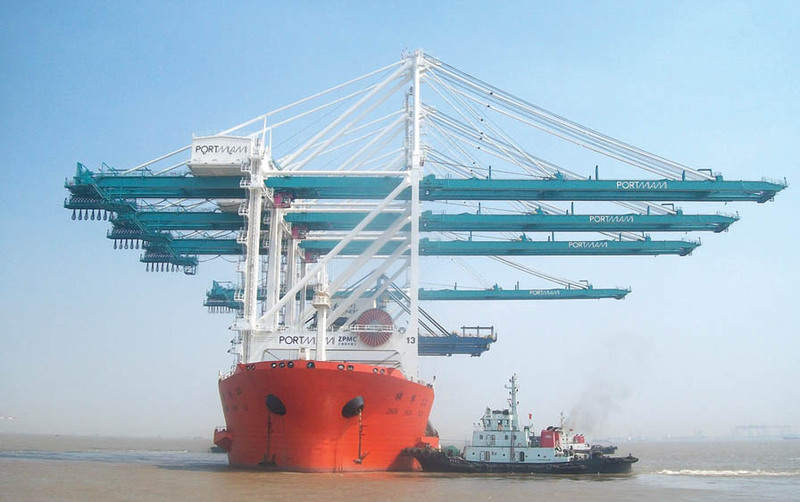 With the larger gantry cranes on the way to Port Miami, port officials in June sold and shipped to Colombia three of its original gantry cranes, in use since 1983. Meanwhile, Port Miami has completed its gantry cranes “electrification.” The electric-powered cranes are expected to provide emissions-free operation, reduce maintenance and eliminate the use of fossil fuels.